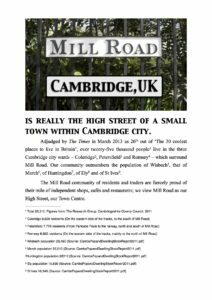 Mill Road – the high street of a small town within Cambridge city? Adjudged by The Times in March 2013 as 26th out of ‘The 30 coolest places to live in Britain’, over twenty-five thousand people live in the three Cambridge city wards – Coleridge, Petersfield and Romsey – which surround Mill Road. Our community outnumbers the population of Wisbech, that of March, of Huntingdon, of Ely and of St Ives. The Mill Road community of residents and traders are fiercely proud of their mile of independent shops, cafés and restaurants; we view Mill Road as our High Street, our Town Centre. Do the various local governance bodies – Cambridge City Council, Cambridgeshire County Council, Greater Cambridge Partnership, Cambridgeshire and Peterborough Combined Authority – treat our community of communities with the precedence and respect which it deserves? Previous Previous post: Time for a Mill Road Plan? Next Next post: A traffic-free Mill Road?